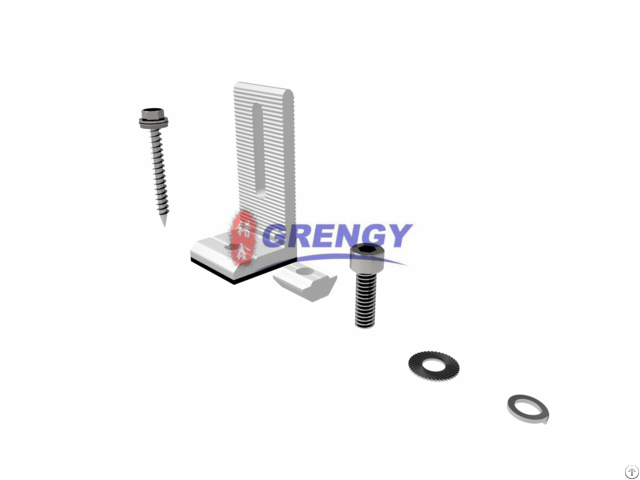 1.Grengy tin roof mounting system has various clamps for alternative, are applied to different color steel roofs. 2.Our brackets have simple structures, standard items which under pre-installation to the maximum extent will help to save your install time and money. 3.They are mainly made of AL6005-T5 and SUS304 material, have good intensity and corrosion resistance. 4.All our mounting systems could be customized according to different requirements with providing mechanics calculation reports. 5.Component swap can be applied to color steel roofs in different conditions. Business Description: Grengy solar has became a top 10 manufacturer of Solar Mounting Systems in China and has own factories with more than 100MW monthly capacity. Our products cover Ground, Rooftop,Agricultural and Carport PV Mounting System.All our mounting systems can be custom-made according to customers' specific requirements.